As a Healthcare executive, you already know the industry is undergoing a dramatic shift. With payers systematically pushing the industry toward value-based care, hospitals and other care organizations must find new ways to control costs and remain profitable. 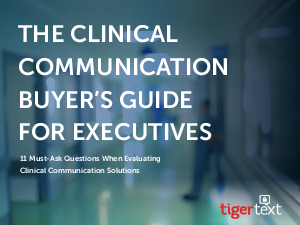 To help you navigate a path to communication efficiency, we've created a list of the eleven most important questions every executive should ask when evaluating a clinical communications solution. Download now!